Rosie offers a discount of 50% on their first / introductory lesson! I am a music graduate from the University of Hull, with an MA in solo violin performance and composition. 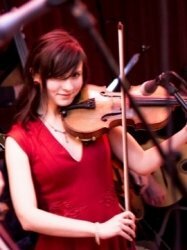 Since leaving University I have been employed as a violinist on a casual basis, performing in a string quartet at weddings, gigs and other social functions. I also play violin in a number of music ensembles in Hull, including the Hull Philharmonic. I have tutored a number of violin and piano students of different ages, levels and music styles. I have also been involved in mentoring the Rhythm Pixies at Kingston Youth Centre, helping young people with body percussion, African drumming, musical arrangement and theory. My teaching style is adapted to suit every student - you may want to work towards grading, or learn just for your own enjoyment. I am happy to give informal lessons and can teach a variety of music styles including classical, folk and popular tunes. RosieFrom Michael (5/5): I find Rosie a very good violin teacher. Always very patient and encouraging. RosieFrom Brian (5/5): Great - Everything you could want in a tutor. RosieFrom Katie (4/5): My girls have had a couple of lessons with Rosie and really like her. She is friendly and accommodating. RosieFrom Corrie (5/5): Very helpful & knowledgeable. Look forward to our next lesson! RosieFrom Ian (5/5): Rosie is a very professional and competent musician and I am finding my lessons both challenging and rewarding! RosieFrom Dave (5/5): Rosie is an absolute delight as a tutor, very positive with an extremely keen ear. She is able to cater for whatever needs are required by the student and adapts her teaching style appropriately. I very much look forward to my weekly lesson. :-) Highly recommended!